Beverly Hills Chihuahua 3, Viva La Fiesta! is releasing on blu-ray combo pack, DVD and Digital on September 18, 2012. 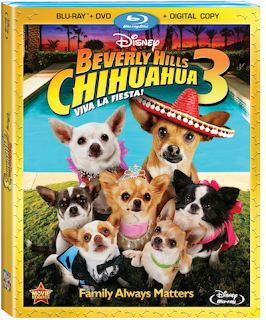 Everyone's favourite talking Chihuahuas Papi (voice of George Lopez) and Chole (voice of Odette Annable) joined by their five playful pups in a fun filled family comedy. It's canine chaos as the Cortez family members, humans and dogs move into the posh Langham hotel, which has all the services including a complete luxurious doggy spa. The movie brings out the importance of family, friends and teamwork making it lots of fun to watch. We enjoyed watching the bonus features; "Hanging with Papi," which is a playful look at the typical day on set with Papi. The English and Spanish versions of the song "Living your dreams" music video was lots of fun. We enjoy watching these types of creative Disney movies as it is well thought out and detailed. Do check out this cute funny movie that will be available on blu-ray combo pack and DVD on the 18th. My kids giggled with #2 - I should check this one out. Thanks. Oh fun! My daughter and I are obsessed with Chihuahuas so I know we`re going to love watching this! I haven't seen any of these yet either but my little one is just getting to the age where she might sit and enjoy something like this!